Club Penguin Cheats by Mimo777 Club Penguin Cheats by Mimo777: Rockhopper's Tree brought to Club Penguin is now Orange! 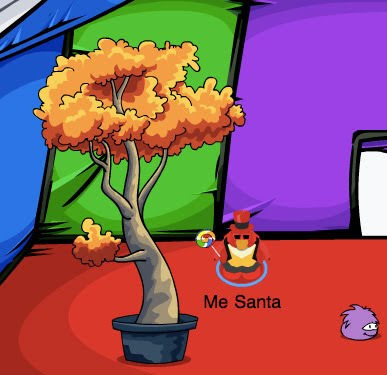 Rockhopper's Tree brought to Club Penguin is now Orange! Many of you told us about your Rockhopper tree turned orange. But why? Some say because it's now fall. So can we expect leaves to fall off of it? Dunno. Some are looking for oranges to start to appear. That's just silly. Some think it will turn into a pumpkin for Halloween! I think something but I'm not saying yet! I will give credit for this cheat, but I have to go back and find out who was the first! mimo what about the new catalog cheats! Spiguy23, Mimo did remember the catolog cheats. They're near the middle, you just have to scroll down after the Rockhopper post. That's what i was thinking. Then in the winter It will have snow on it. He posted those. Just scroll down. you might know this but i will tell you anyway. at the main menu of jet pack adventure the penguin flying on the screen is the same color as your penguin, so if you change your color that penguins color changes to. How to get this tree?? Where are those peeps getting balloons?? Mimo have you noticed there aren't white puffles in any of the fair games? That's so weird! Why do you think they didn't put any in? it is for fall because my plant had flowers now it's gone pale and has lost its flowers strange!! Mimo has already posted this. Scroll down and if you can't find it look under "older posts". Rockhopper brought this tree the last time he came with all the mysterious plants that we could buy. Some of them are in the box dimension! They are from an older catalog. Brad or Budge123, I'm pretty sure Mimo knows that. Frosti94, I think that Clubpenguin didn't put the white penguins in because maybe they did the puffles by the older they are. -Blaze_The_Cat, good catch! You are a good cheat finder. Where are those peeps getting balloons? It is an item in the catalog. If you have a membership it is possible to purchase it but if you don't have a membership, you require one to get the balloon. Also I hope the trees grow pumpkins! I don't think I got one of rockhopper's plants. boo hoo! WOOT WOOT! im loving the fall fair are you to? when do u think the new prizes will come out and what do u think they will be? i think the purple n black hat will be there n a mustache ROFL! awesome but im not a member. he has posted em already, just scroll down and u will find em! yes well im sure we are all aware of that, and it does the same with surfing too, but thx for trying to help! Umm, I'm sorry to say this but you could only have bought it when Rockhopper came last time. He was selling them during the adventure party or something like that. It was in his pirate catalog. Yup, he knew that. Just like on bean counters it's the same thing, and also in aqua grabber and hydro hopper i believe it's the same to. So great to see your trying to become a CPG MOD. Here are some tips to help you out. 1. Copy and paste the persons question, then draw a line or ~~~~ to seperate the question from the response. also put (CPG MOD) at the end, not wantabe CPG MOD. That way you will look confident, because you shouldnt wanna be on, you will be one. WHen Rockhopper came, back in june, he brought some odd plants with him. if you bought the plants, and put them in your igloo, you would see that they would grow almost every 2 weeks, and flourish even more. now the 3 flowers look so incredible. Especially the tree one. White penguins i dont think will ever exist because they would blend in with the iceberg... which would be disastorous! all these crazy invisible penguins lol. Rockhopper bring it last time..
All trees go orange on september!!! Awwww poor tired puffle :(... probably in the backstage area of the puffle circus they all have there beds. The yellow puffle better have the biggest bed seeing as he does most the work. Amazing you are always right rock on mimo and my tree turned giant green! theres no such thang as a halloween three cuz its still next next month by the way mimo its 108 days before xmas!lol P.S. i didn't count the days before xmas its becuz im too lazy saw it on news doh! mimo how do sneak into member only places? before the tree was orange fruit was growing on it i have millions of them, also the flower plants flower petals have fallen down. Hey Mimo it's because of the seasons!!!!!!!!!!! Did Me santa get a new igloo last time you showed us his isloo it was a snow globe. First comment I ever typed.